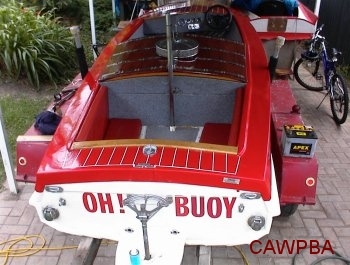 Steve Henry decided he needed a project to keep himself busy at home and after seeing the runabout OH! BUOY up for sale on the club’s website, decided it fitted the bill perfectly. 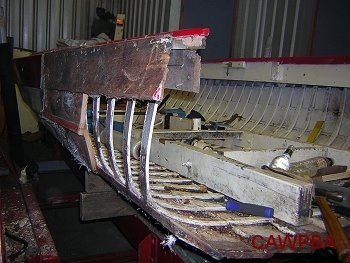 Steve purchased the 16’ clinker and set to work immediately. 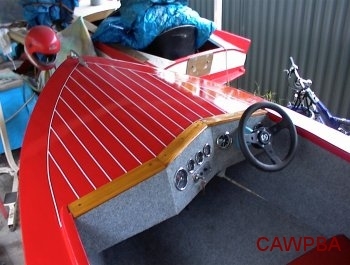 Getting a positive ID on the boat, believed to be an Everingham, was made that little bit more difficult by the fact that it had been modified in the cockpit and dashboard areas. The tell tale flattening off of the stem as it comes up under the deck still points towards its Everingham roots. 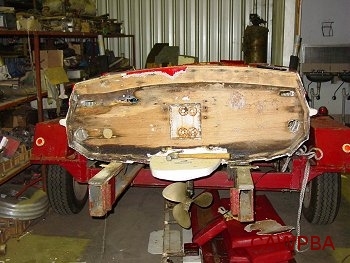 After relieving the boat of its 292 ci Ford Y block engine and all other hardware, it was time to strip the fibreglass sheathing from the hull and deck and find out what was underneath. With the glass removed Steve found that there was substantial rot in a few planks around the transom as well as in the transom itself. Steve decided that this work would be done prior to turning the boat over and continuing to strip the glass from the bottom of the hull. 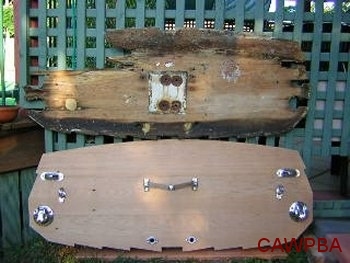 The transom was removed as well as the sections of planking affected by rot. The planks are of solid timber (not ply) and while originally thought to be red cedar, were later identified as meranti. A new transom was built up using the original as a pattern. With good access to the inside of the hull, the tedious task of removing years of paint and grime from the bottom of the hull was started. Steve commented that while stripping he had plenty of time to study every detail of every inch of the hull. 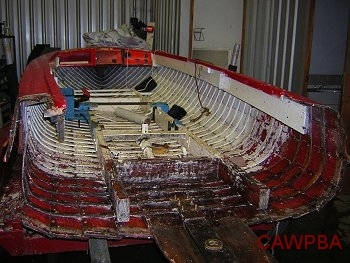 Six layers of paint were removed along with Sikaflex, epoxy, fibreglass and even putty. A split was found in each of the planks alongside the keel. Steve believes these were the result of the poor alignment of the trailer beds and the boat’s engine bearers. Although he says he spends only about one hour each week day working on the boat, Steve’s progress has been amazing. As the internal paint came off it showed the timber at the bottom of the hull to be in quite good condition, apart from the splits mentioned previously. Also revealed was a substantial repair that had been carried out on one plank from just forward of the engine right up to the stem. This repair was still solid so needed no further attention. As a bit of a break from paint stripping, the remainder of the deck was removed, revealing the need for new stringers up front and a trial fit up of the transom was carried out. The transom was a perfect fit.